Ithink April must be one of my favourite months as a gardener – the air is warm and usually the soil has warmed up too, so it’s an ideal time to be planting and growing especially in the vegetable garden. And if you haven’t even started but want to have a go this year, good news – you are not too late. Make sure any areas you want to plant are well dug over and free from perennial weeds. I work with a raised bed system, as I find them much easier and less work. The beds should be around four feet wide so you don’t need to tread on the soil to plant them. It also means that any compost you add goes directly on the areas where it’s needed and is not wasted on the path. Last month I emptied my entire compost bin onto the vegetable patch. The compost was about two years old so ideal to add straight onto the soil surface. I layer it on like a mulch and then only dig it in as I plant. Compost is an excellent way to add humus to the soil; it is the humus or organic matter in the soil that helps its structure and fertility. If you have a light sandy soil, it helps keep the moisture in, if you have a heavier clay soil it makes it more workable. Unlike just adding chemical fertilisers, compost also contains numerous bacteria that break down the organic components so the plants can absorb the nutrients through their roots. For all these reasons it is an essential part of growing your own produce. It doesn’t have to be your own home-made compost – well-rotted manure is just as good and actually has a higher nutrient content than compost. For this reason, if I’m planting into my own compost, I do add an organic feed like blood, fish and bone to boost the nutrient levels. Not all vegetables like growing directly into compost or manure; some of them find it too strong and prefer to grow on a bed that was fed in the previous year. This is where a well-planned crop rotation system works so well. In a crop rotation system, crops are grouped together into the conditions they like growing in: brassicas, peas and beans, onions, umbellifers (this includes carrots) and “other crops” such as spinach, herbs and flowers. Potatoes and courgettes need a heavy feed, whereas lettuce and herbs prefer to be on soil that was composted the previous year where the larger amounts of compost have all been taken into the soil by worms. Getting these basic factors right in your vegetable patch will give you success in growing strong, healthy plants that crop well and have better disease resistance. My potatoes were sown last month into a trench with compost and some extra organic fertiliser – the trenches are mounded up and marked so I know where to expect the tops of the potatoes to poke through. I grow only salad potatoes, and the variety “Charlotte” is my favourite. Potatoes are an excellent crop for breaking up new ground and they are easy to grow. They do take up a lot of space in the growing season, which is why I only grow one type, but if you have more room you can grow a range, from first earlies to main crop, and keep yourself in potatoes most of the year. My broad beans are starting to come through now. I’ve planted these earlier in the year to try and get them to crop before the black fly hit in June. The black fly tend to go for the tips of the plant, so another trick is to pinch out the tops and get there first. Also the tips of broad bean plants are delicious added to a salad or stir fry. I’ve grown a heritage variety of broad bean this year called “Leidse Hangdown” – the heritage varieties of vegetables are the older, often-forgotten ones that were also grown for exceptional flavour and so well worth a try. 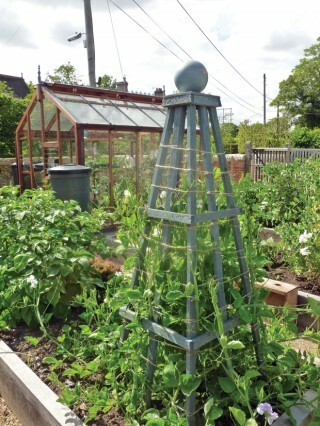 Once the broad beans start to get going, a structure of twiggy branches is needed to support them. Hazel twigs are ideal for this. My courgettes are coming up in the greenhouse, where I grow them in pots to start them off before I put them out. One thing I have found works well is to soak courgette seeds overnight before planting them, which seems to help them germinate better. I’m growing the yellow-fruiting courgette again as I find it is the sweetest. When the frosty nights have gone, later in May, plant them out into a sheltered site, trying to disturb the roots as little as possible. Courgettes are one of the few vegetables that don’t mind some dappled shade and so will grow successfully under runner bean plants. I’m trying to get my vegetable garden up to scratch this month as towards the end of the month I will be busy building and planting the celebrity stage at the Malvern Spring Festival. More to follow on this in next month’s magazine.